Click here to expand map to full size! 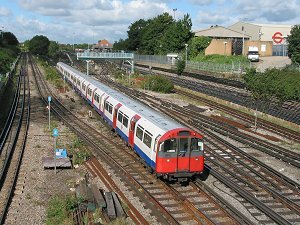 1) Subsurface lines which include the Circle Line, Hammersmith & City Line, Metropolitan Line and District Line (and previously also the East London Line). The different subsurface lines are interlaced, and the District Line actually represents a small metro network by itself. 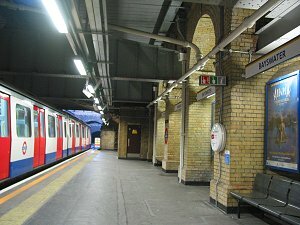 The subsurface lines run at low depth or on the surface and are among the oldest London Underground routes. 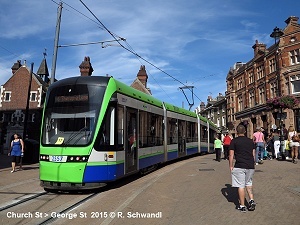 Trains used on these lines are 2.85-2.95 m wide and 3.69 m high. 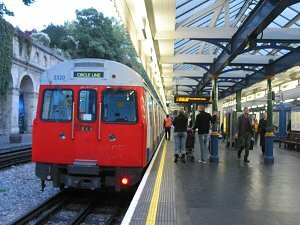 2) Tube lines which include the Northern Line, Central Line, Bakerloo Line, Piccadilly Line, Victoria Line, Jubilee Line and the Waterloo & City Line. 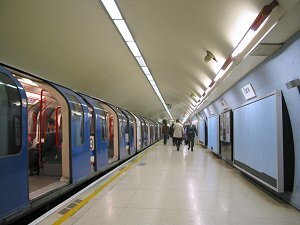 In Central London, the tube lines run through deep tube tunnels, and trains are 2.64 m wide and only 2.88 m high. 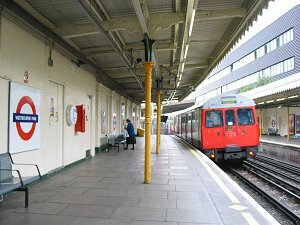 Outside Central London, many sections of the tube lines run on the surface. 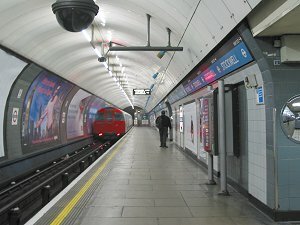 The tube lines represent about two thirds of the total length of the network. 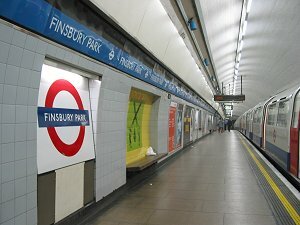 The entire London Underground is therefore also known as "the Tube". 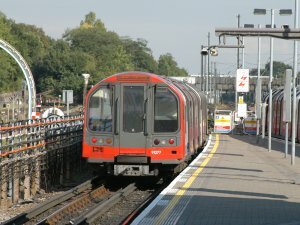 Due to the different train and tunnel profiles, subsurface and tube lines can only share the same tracks on surface routes, which is the case on the section between Rayners Lane and Uxbridge, which is served by both the Metropolitan Line and the Piccadilly Line. 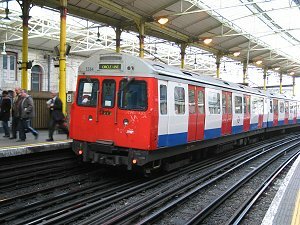 Bakerloo Line trains share mainline tracks (now part of the London Overground network). 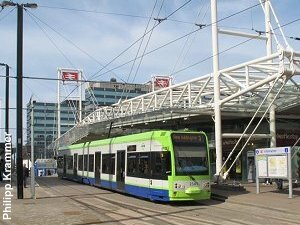 Besides the London Underground system proper, the Greater London area is served by the growing Docklands Light Railway, London Tramlink, London Overground plus numerous frequent suburban trains radiating from the various terminal stations and the cross-city Thameslink trains. 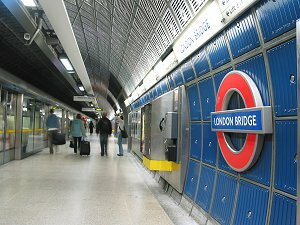 London is the mother of all the world's metro systems. 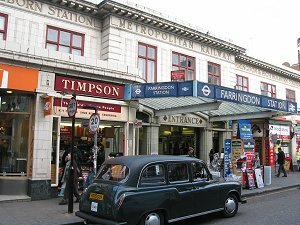 Already in 1863 the first tunnel was opened in the city centre for a rail line between Paddington (originally called Bishops Rd) and Farringdon although trains of the Metropolitan Railway were operated initially with steam engines. 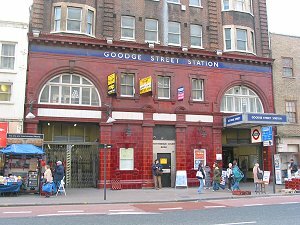 In the following decades the line was extended east and west, and reached Hammersmith in 1864, South Kensington in 1868, Aldgate in 1876, and Tower of London in 1882. 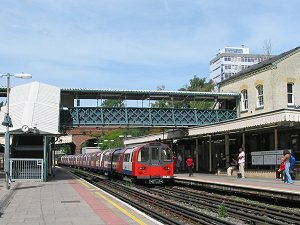 A northwestern branch was opened from Baker Street to Swiss Cottage in 1868 which was later extended in stages as far as Chesham by 1889. In the meantime, between 1868 and 1871, the Metropolitan District Railway built a line between South Kensington and Mansion House. The entire circle was finished in 1884 with the Mansion House - Tower section. 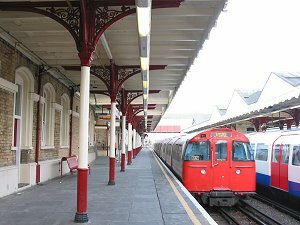 The District was also extended at both ends during the following decades and served Hammersmith in 1874, Richmond in 1877, Ealing Broadway in 1879 and Wimbledon in 1889. 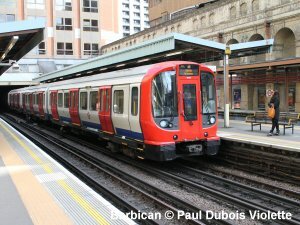 The Metropolitan Line persists on the London Underground map (although part of the original line now is the Hammersmith & City Line) and has become a synonym all over the world for many different kinds of urban rail transport systems. This first line was so successful that very quickly a large network of underground and surface lines was built. 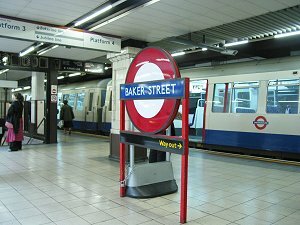 The first "real" metro line, however, was the City & South London Railway, between Stockwell and King William Street (later replaced by Bank) in the City of London, which opened on 4 Nov 1890 and which is part of today's Northern Line. This was the first underground line in the world using electric traction. In 1898, two years after Glasgow's cable drawn subway and Budapest's first electric underground line had opened, another short electric tube line started operating in London, this is today's Waterloo & City Line. 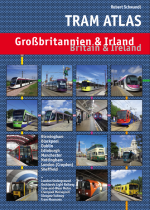 From 1900 onwards, the Metropolitan and the District Railways began electrifying all their lines. Most of today's underground lines were built in the first half of the 20th century in deep level tube tunnels within the central area of London and extended above ground through the suburbs. 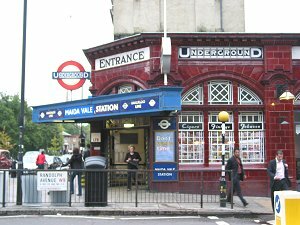 Later, in the 1960s, the Victoria Line was an important addition to the network. Eventually the Jubilee Line complemented the current system in time for the Millennium celebrations. 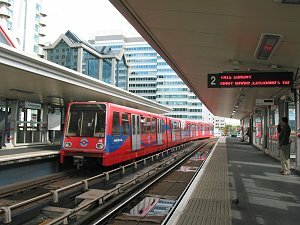 While the expansion of the underground network almost came to a stop in the 1970s, a light rail system was built for the new housing developments in the former docklands area, the Docklands Light Railway, which was expanded underground under the River Thames to Greenwich and Lewisham (opened 20 Nov 1999 except Cutty Sark station). 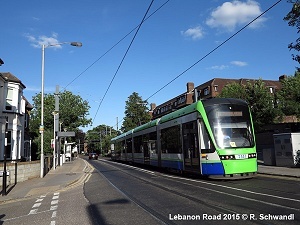 In South London, around Croydon, a modern tram network was built which runs on street level in downtown Croydon and on old BR tracks on outer routes. The system opened for traffic in summer 2000. 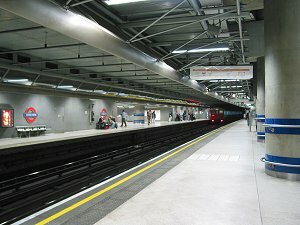 In 1993 construction work for the south-east extension of the Jubilee Line began. 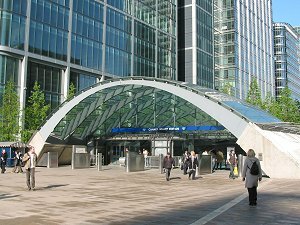 The above ground section between Stratford and North Greenwich opened May 14, 1999 with the entire extension entering service in various stages until 22 Dec. 1999. 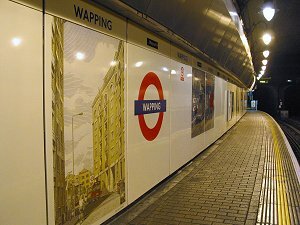 Former Jubilee Line terminus at Charing Cross was closed on 20 Nov. 1999. 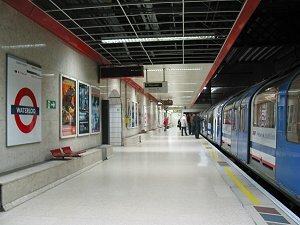 On 13 Dec 2009, the traditional Circle Line ceased to be a proper circular line, it now operates from Hammersmith to Edgware Road via the entire circle. 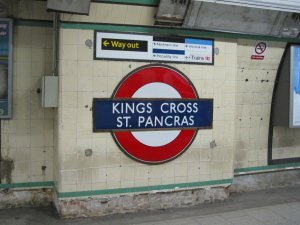 Until 13 Dec 2009, the Circle Line was a real circular line (20.5 km), but now it is operated from Hammersmith to Edgware Road via Paddington, Edgware Road, Liverpool Street, Embankment, Victoria and High Street Kensington. On almost its entire route, the Circle Line shares tracks with other subsurface lines. 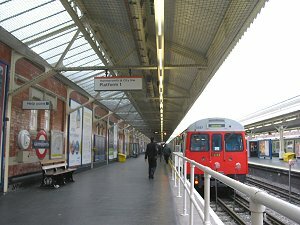 On almost its entire route, the Hammersmith & City Line shares tracks with other subsurface lines, although until Dec. 2009, the section between Hammersmith and Edgware Road had been exclusively served by the H&C for many decades. 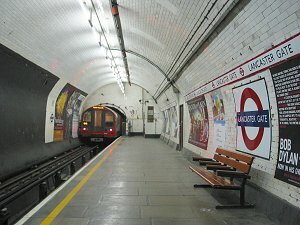 The central segment of the Northern Line incorporates what was the world's first electric underground railway, opened in 1890 between Stockwell and King William Street (near the present Monument station). The Northern Line probably has the most unconventional route layout worldwide, with three northern termini and one in the south, plus two different routes through the city centre, resulting in complex service pattern. From the northern branches, southbound trains continue through the city on alternating routes (indicated "via Bank" or "Via Charing Cross"), with some trains terminating at Kennington. 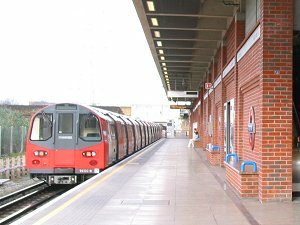 There are recent plans to extend the Northern Line from the Kennington loop to Battersea Park with an intermediate station at Nine Elms. 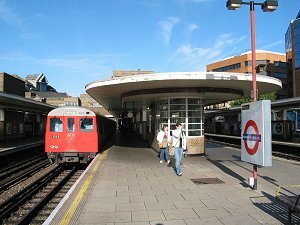 Opened in 1900, the Central Line is a cross-city tube line right through the heart of London, with two branches at the western end, and two at the eastern, where the Hainault loop is served frequently by trains via Newbury Park to Hainault, but on the Hainault - Woodford section there is a train only every 20 minutes. 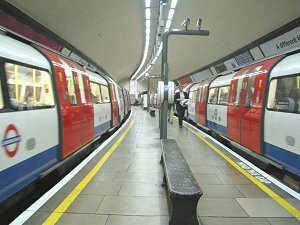 The Waterloo & City Line is a non-stop shuttle service between Waterloo railway station and the City of London. 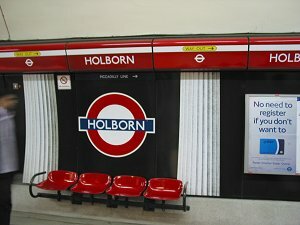 It only became part of the London Underground system in 1994. 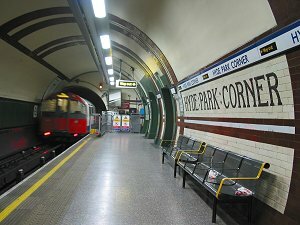 The Bakerloo Line is a typical tube line on its route through the city centre, opened in the first decade of the 20th century, but north of Queen's Park it shares tracks with London Overground services (Euston to Watford Jn), so the tube trains have to stop at platforms which have a height between the typical tube platforms and those of mainline railways. 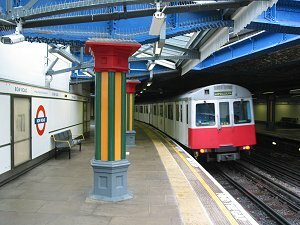 The Piccadilly Line is a typical tube line from the early 20th century, although some of the western sections date back to 1877, when they were opened as part of the District and Metropolitan Railways. It runs from the north towards the west, where it splits into two branches. 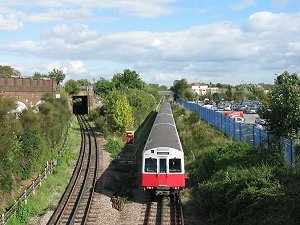 On the Uxbridge branch, tracks are shared with the Metropolitan Line between Rayners Lane and Uxbridge. 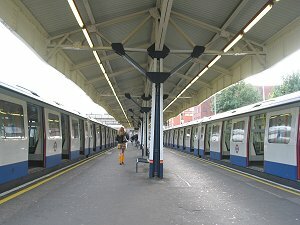 Between South Kensington and Turnham Green, the Piccadilly Line runs parallel to the District Line, but on separate tracks. On the Heathrow branch, trains either run around the Terminal 4 loop in an anti-clockwise direction or go directly to Terminal 5. 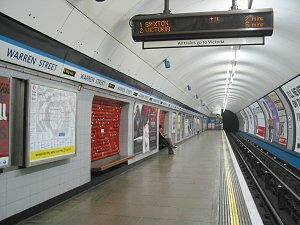 The Victoria Line is a relatively new tube line built in the 1960s to create yet another north-south link through Central London and connect several railway termini. 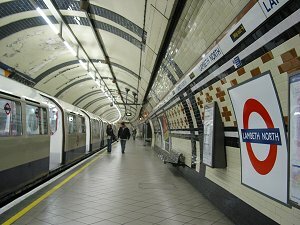 The Victoria Line is completely underground. 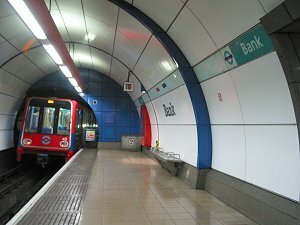 The Jubilee Line is the latest addition to the London Underground network, although some sections on its northern part had opened in as early as 1879 as part of the Metropolitan Railway. 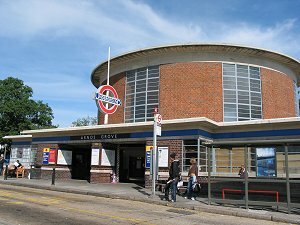 The route to Stanmore was initially a branch of the Metropolitan Line when it opened in 1932, it was transferred to the Bakerloo Line in 1939, and was eventually integrated into the new Jubilee Line in 1979. 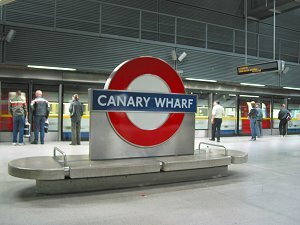 The Jubilee Line was finally extended to Stratford via Canary Wharf in 1999. 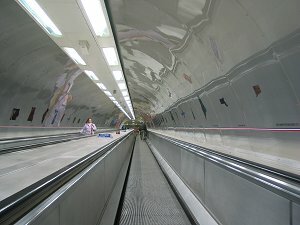 The underground stations along this extension are equipped with platform screen doors. 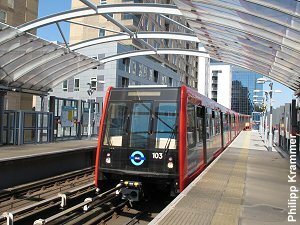 5) Stratford International - Woolwich Arsenal / Beckton. The London Overground network was launched in November 2007, after the North London Line (Richmond to Stratford), the West London Line (Clapham Junction to Willesden Junction), the Gospel Oak to Barking Line, and the Watford Junction to Euston Line, all previously operated by Silverlink, had been taken over by Transport for London in order to create an S-Bahn/RER-style service by incorporating the upgraded East London Line and establishing an orbital service in the mid-term.